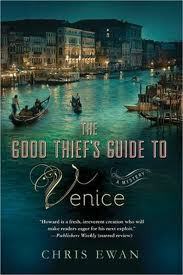 Chris Ewan has produced "Good Thief's Guides" to several cities already but the book set in Venice is the first one I've picked up. The books are not, of course, tour guides or thievery guides, but clever crime novels. The two covers illustrated here, from the U.K. and the U.S., illustrate the two halves of this book: the genuine appreciation of the city of Venice and the comic approach to the crime novel (the U.K. cover seems to be designed to capitalize on the cover's blurb from Colin Bateman, in fact). But Ewan's novel is not as funny as Bateman's books, at their best. It's not so much a comedy as a light-hearted crime novel. Charlie Howard is a professional housebreaker who has sworn off his life of crime to pursue his other profession, writing crime novels featuring a housebreaker. There are a few times when the book becomes "self-conscious" or a "metafiction" in a comic way, but for the most part, the story is told straight, in Charlie's own voice. Charlie's voice is self-centered but also self-critical, and he's good company. He's wakened in the middle of the night by a female burglar who steals only his prize possession and the magic talisman that keeps his writing on track, a framed, signed first edition of The Maltese Falcon. She leaves clues that lead finally to her challenge: she'll give the book back if he returns a briefcase to the home of a wealthy Venetian count; and he's forbidden from opening the case. There are surprises and twists in the plot, but the point is not really the danger to Charlie, his agent Victoria (who's staying with him in Venice), the count, the book, or the burglaress, any more than the various threats are the point of, say, The Pink Panther (and Ewan's Guide is in a way a throwback to that sort of comic crime). Charlie's a bit obtuse about some things, and in some ways hardly seems to rise to the level of "master thief" that is ascribed to him (maybe that's more well established in the earlier books). Charlie's meanderings around Venice are interesting glimpses of the city, and the story is entertaining, while not being either laugh-out-loud funny or serious about the genre. Given the light tone, I found the book to be a little long. Fatale, on the other hand, is very short. 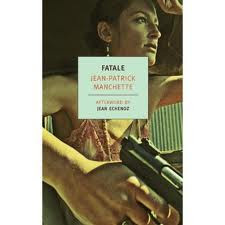 Jean-Patrick Manchette is a revered French crime novelist, two of whose books have already been translated, Prone Gunman and Three to Kill, both of which I liked. Fatale, though, seems artificial or contrived, a thesis novel more than a fully realized fiction. It's about a female hitman with a very complicated way of doing business that's only gradually revealed. She's the center of the story, but isn't much fun to be around. Her skills are employed ruthlessly until things start to get complicated in her last job, which is mostly the subject of Fatale. But I found it hard to care much about her, the job, or her victims. I have a sense that Manchette didn't intend for us to get too involved: he's not so much telling a story as a fable or parable. I don't know whether this is more obvious here, with a female heroine, than it was in the other two novels, both of which centered on men: I may go back and re-read the others to see if that's the case. However, it's an intense book in the mode of classic noir, a descent into hell without any redemption. For that alone, the book is well worth reading, and the shortness of the text makes that easier to do. But prone gunman is, as I remember, a more fully rendered hitman story. You seem to have been drawn to totally different ends of the spectrum in this blog entry, from comical and light-hearted to dark and intense! I also talked about character recently in my blog, though it was more about how the setting influences the character and vice versa. I'd love your feedback!